Yoko (from HOMAKO) has just returned to LA from Japan, where she is originally from. She experienced the earthquake first hand and witnessed the massive destruction and devastation it has caused. Her family and close friends are still there and she is raising money through her shop to send to the American Red Cross. For more information and details click here. Yoko makes the finest jewelry! The Kuru Maru Felt Ball Necklace was recently selling at Anthropologie and is now completely sold out in stores. She is kindly offering her most popular necklace, the Kaleidoscope Felt Collage Necklace (check out my bestie wearing it!) to one very lucky I ART U reader. To enter, "Heart"/favorite HOMAKO on etsy, then leave a comment on this post with your favorite item from the shop. She is also offering free domestic shipping during the duration of this giveaway. Enter "HEARTJAPAN" in the coupon redeem box when checking out. And, if you buy a piece from HOMAKO, comment on this post letting me know and you will receive an extra entry. Giveaway ends March 29.
i love love love the kaleidoscope felt necklace. i'm so glad you're hosting the giveaway. thanks for chance. Fuwa Bow Necklace Mini Mocha <--that necklace is really cute! I really like the necklace being offered in this giveaway as well! I love the Fuwa Bow Necklace A with Brown Rope! Oh my. I love these. My fav. is the Kaleidoscope one...so fantastic. i have been a fan of this shop for some time and would love to own a necklace from it. i'm sorry to read that yoko and her family were in japan when the earthquake hit but i'm glad she's safe. my favorite piece in her shop is probably the felt ball necklace, but all of her stuff is really pretty so it's hard to choose. wow... my heart goes out to Yoko and her family. I cannot begin to imagine what they're going through! On a happier note, I absolutely love her kaleidoscope necklaces-- especially the orange maple one! So darn cute. her shop is full of adorable finds! i especially love the wakusei necklaces and the big bow rope necklace-- TOO CUTE! What beautiful and unique jewelry! I love the Fuwa Bubble necklace and the Felt Ball necklaces, but those kaleidoscope necklaces are awesome!!! I would love to own one! I love the cute quirky-ness of Homako's jewelry! I absolutely love the Maru Buttons FUN necklace and the Kaleidoscope Felt Collage Necklace. Oh my goodness these are gorgeous!!! I adore the Fuwa bubble necklace but I'd be thrilled to wear anything from her shop. Amazing amazing work. I've been a fan of Yoko's creation for a while, and The Origami Kuru Shou necklace is my current favorite. I'm donating to the Red Cross from the sales of my etsy shop too hope it could be of a little help. Wish everyone in Japan stay strong! All the best for Japan . i love seeing all the artists come together for japan :). 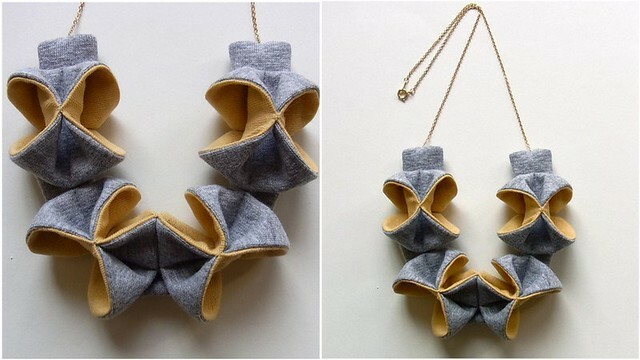 i love the kaleidoscope felt necklaces! Oh my! How gorgeous are all those necklaces! My fave is the Fuwa Bow Necklace A with Brown Rope. 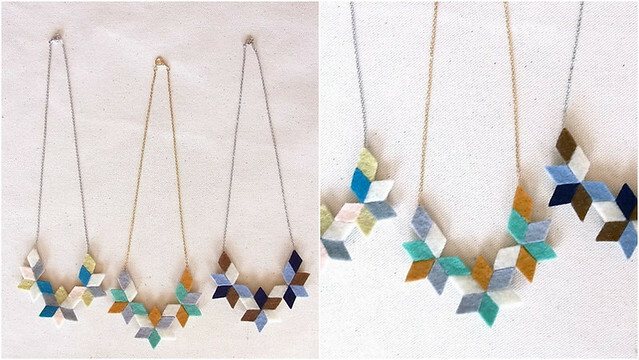 hard decision, but i think my favorite is the kaleidoscope felt collage necklace in orange maple w/ gold chain. p.s- Just bought an item too! I love the Pastel Rock Candy necklace; I think the strand of pearls really adds a lot of fun classiness to it. hearted the shop as jhbalvin. I hearted Homako on etsy as 409cope. I added Homako to my favorites on Etsy (my username is Aledeane). What a gorgeous shop! Such original items,I love them all. I think my favorite is the Ori Ori Stripe Necklace Red x White. Difficult to say which one I like best, so many treasures! If I have to choose, I'd say Ori Ori Linen is my favorite. All the best to Yoko and her family. I've known homako's work for a while now, I've been a faithful fan from flickr and etsy for years. My favorite necklace right now is this one: http://www.etsy.com/listing/65318512/origami-kuru-shou-sienna-last-one. All the best to her and her loved ones, hope she succeeds on her money raising for Japan goal. Eeks, I loooove her work! Hearted the shop @ohmydarlingvintage, and love the kuru maru felt ball necklace S size in California colors. I love Yoko's stuff and I'm so happy she's returned to the US unharmed! I think I like the kaleidoscope necklaces best! love the Kaleidoscope felt collage Necklace and Bubble Butterfly Necklace. I have just purchase the Bubble Butterfly Necklace! I met Yoko at a craft fair in LA and I fell in love with her work! 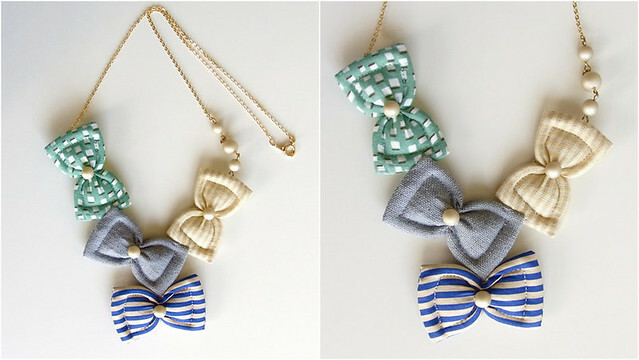 I love the bow rope stripe nautical necklace and the ori ori necklaces. So cute! Hearted the shop (BLehner) and I adore this necklace http://www.etsy.com/listing/65318512/origami-kuru-shou-sienna-last-one ! I love the Bow Rope Stripe Nautical Necklace- simple yet bold! My favorites are between the kaleidescope and red x white stripe ori ori necklaces! I added her shop to my etsy favorites (username: ruricloth) and my favorite item is the Maru Buttons FUN necklace M1-11! Love the fuwa bubble necklace. I hearted her on etsy (username fsl324) Thanks for the giveaway! what a fun shop! i love the Kuru Maru Felt ball necklace! email in profile! I hearted! I love the fuma bow necklace A.
I have to say the kaliedascopes are my favorite - I love the teal!! I've got you hearted - thanks for the chance! And thanks dear Jennifer for this nice giveaway, I really like her designs. Specially the kuru maru felt ball necklace and Kaleidoscope felt collage Necklace. So gorgeous. I hearted Homako on Etsy (hellokiki). My favorite item is the Kuru Shou Mix light grey + yellow necklace--so cute! I hearted her shop - I'm smartbottomkids - and I love the Taira Polka Dot necklace D! The bow necklaces are super adorable! My favorite item from the shop is Diane Necklace limited edition. I hearted the Etsy shop, etsy name Viorela25. I hearted her shop on etsy (VintageWhale) and I love the Ori Ori Necklace! Hearted !! Love the Fuwo Mini Mocha necklace!! Hello, I hearted HOMAKO's Etsy shop. My username is: sunsetstudies. My favorite item is the Bubble Butterfly Necklace. <3 the ori ori necklaces. I hope her shop gets slammed with purchases so that she can raise lots of money for those affected by the tsunami in Japan! I LOVE the BIG Bow Rope Necklace! So pretty! I adore Yoko's jewelry! I hearted her shop on Etsy (oksana2372). An one of my faves is Diane Necklace limited edition! so glad I made it just in time for this awesome giveaway ;) have just hearted (house 09) her shop and really love the Sakura Pom earrings... crossing my fingers! hearted (staycelyne) and love the kuru maru necklace! or the ori ori. =) love so many!! I love the Fuwa Bow Necklace!!! I added her to my favorites on etsy! I think my favorite is the Fuwa Bow Necklace B with chain, it's so adorable! I hearted her shop as aimeeq111 on etsy. Such cute stuff! The Origami kurukuru necklace in black and white has to be my favorite, but everything is so flippin cute! I hearted the shop as magnolica. I really like the Origami Kuru Shou MIX -Light Gray x Yellow! Taira Polka Dot necklace D is my favorite. wow you are so talented! that bow tie necklaces is beautiful! I love the bow rope stripe nautical necklace!